Since a Cleveland Browns season is nearing completion, it’s only natural for fans and media to start wondering about who’s getting fired. The consensus belief seems to be owner Jimmy Haslam will ax everyone once again, going through his fourth restart since buying the team in 2012. However, there’s always a chance either the front office or coaching staff survives. After all, Haslam has done nothing but preach patience since hiring this latest regime. While keeping either Sashi Brown and the front office or Hue Jackson and the coaching staff wouldn’t be completely maintaining the status quo, it would at the very least keep some semblance of consistency. The obvious question in this scenario is just who exactly would be safe between the two parties. Considering the blunders we’ve seen from the front office over the past couple seasons, you’d think Brown and company are on borrowed time. However, not only can you make a case for keeping them around, but also doing so while sending Jackson packing. Personally, this wasn’t a scenario I’ve put much weight in. There have been more than a few indications Haslam would favor his coach over his front office, meaning Jackson might get at least another year. However, Cleveland’s coach has done himself no favors lately. His petty behavior over the past couple weeks is only making his firing more and more necessary. As mentioned yesterday, Jackson is spending way too much time deflecting blame and taking shots at the front office. While he’s no doubt frustrated with the Browns’ 1-25 record under his watch, this behavior comes off as extremely spiteful. To insist the team’s struggles are all because of the front office, while also refusing to even pretend his relationship with Brown is on good terms, only makes things worse. It’s also blatantly ignoring the fact Jackson has indeed had a hand in how bad this team is playing. He’s severely mismanaged rookie QB DeShone Kizer. His game-plans have been questionable at best more often than not, and his in-game management has been sloppy. As much as I’d hate to burst Jackson’s bubble, there’s plenty of evidence proving his time in Cleveland should soon be coming to an end. Of course, this isn’t to say the front office has been perfect over the past couple years. There’s certainly enough reasoning to send Brown packing, too. This regime has made plenty of headlines for how poorly it’s taken to finding a franchise quarterback. It also got things started last year by letting every veteran free agent walk out the door. Additionally, questionable signings (see: Britt, Kenny) have been an issue, too. Top it off with the now infamous AJ McCarron trade fiasco, and you can easily question the value of this crew. Despite all of this, you can also find ways to defend Brown and the rest of the front office, enough to at the very least give them another season. For one, you can’t deny how solid Cleveland’s set-up is for the 2018 draft. The Browns have two first-round picks and three second-rounders, so there’s a chance the team comes out of the weekend with five potential impact players. This is all the result of Brown’s wheeling and dealing, and not only could it help this team take a big step forward next offseason, it’ll be a very appealing sell for potential coaching candidates. Additionally, as bad as the position of quarterback has looked under this front office’s watch, improvement can be seen elsewhere. There is clear talent on the defense, found both through the draft (Myles Garrett, Emmanuel Ogbah) and offseason acquisitions (Jamie Collins, Jason McCourty). While the offense could definitely use some upgrades, wideout Corey Coleman and tight end David Njoku have shown promise. 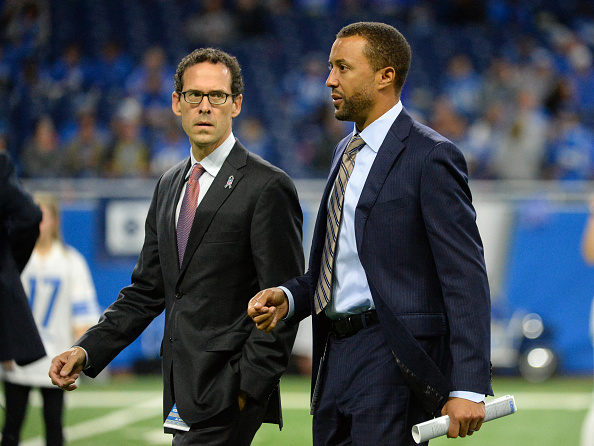 Bottom line – despite the struggle to get a quarterback, this front office has been able to find talent and potential building blocks. During such a grueling and lengthy rebuild, such a thing can’t be ignored. Again, Haslam is no doubt looking for any way he can maintain at least some level of consistency. While scrutiny will come regardless of who he decides to save, it would at the very least prevent yet another complete tear-down. The front office has had its fair share of mishaps, but don’t let this cloud the fact it’s also made some crucial finds. If Haslam is going to let anyone stick around to see their vision through, you can make a strong case it should be the front office.